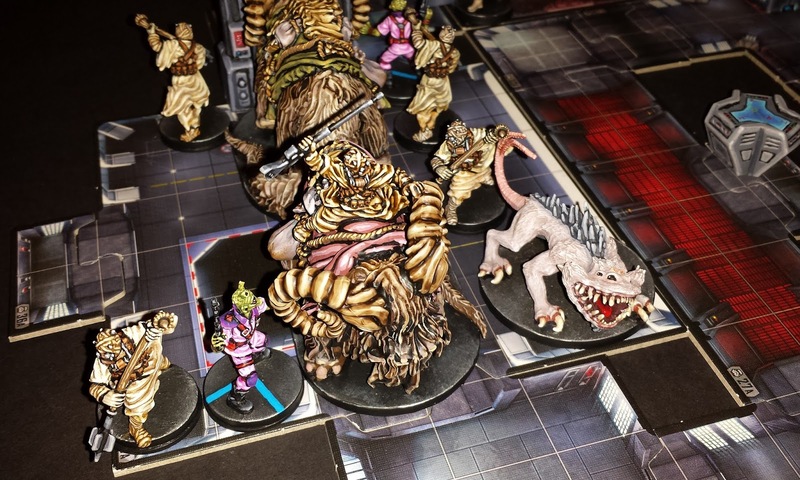 What happens when you release two rabid Banthas into a tiny space-space station? This question, and so many more, are answered in this week's post. Yes, its time for another battle report for Imperial Assault. 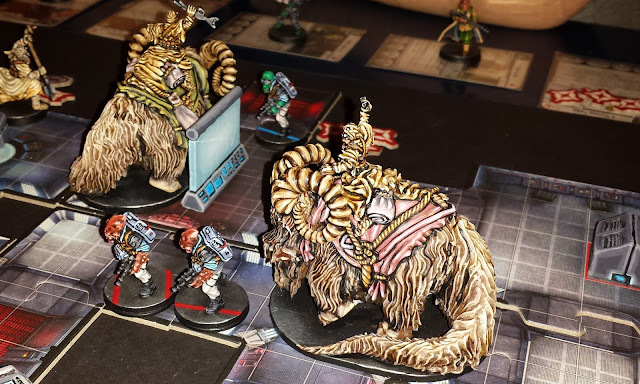 I sat down with my friend Nicos to fight out the "Incoming Transmission" scenario, and (more importantly) to see how the new Bantha Rider models perform in a skirmish game. The map was the Kuat Space Station. My army of Bantha-heavy mercenaries began the action in the blue docking bay. Nicos' force, entirely consisting of Rebel spies, started in the red zone. Each turn, the three relay stations (marked with X's on the map) accrue more victory points -- a player who controls a relay station can activate it in order to collect these points and discard the station. The set-up contained no surprises. 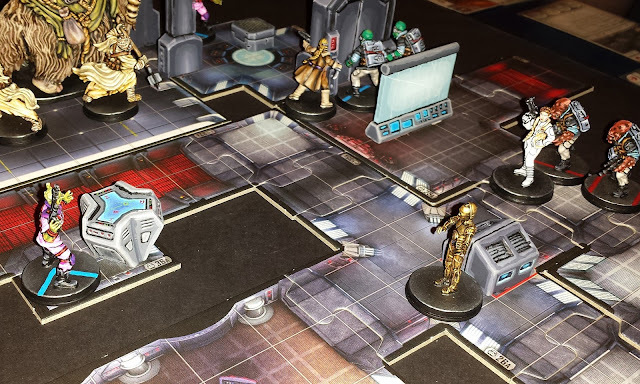 Both sides divided their teams in 2 parts -- with one half aimed at the Northwest relay station, where the armies were separated from each other by a pair of blast doors. The second half of each army was poised to pour into the rest of space station. The Mercenaries had the first move. 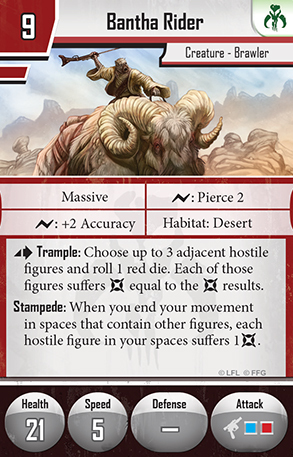 Deployment Cards: Bantha Riders x2; Beast Tamer x2 (attached to each Bantha); Tuskan Raider x2; Nexu; Hired Guns; and Punishing Strike. Command Cards: Jundland Terror x2, Size Advantage; Survival Instincts; Crush; Ferocity; Roar; Close the Gap; Single Purpose; Celebration; Element of Surprise; Opportunistic; Rally; Take Initiative; and Urgency. Strategy: I'm not sure I can dignify my approach with the term "strategy". I would rush my opponents with the Bantha and use stampede and trample to mash them into pudding. To assist this, I could exploit the many command cards that enhance creatures (and especially Bantha Riders). Finally, my Tuskan Raiders would throw their Gaffi Sticks around, applying weaken or (with the help of Punishing Strike) stun. 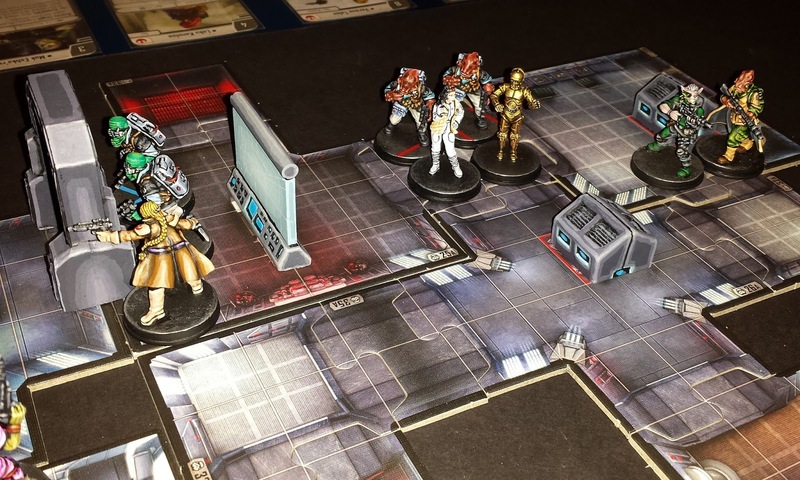 Deployment Cards: Leia Organa; Combat Suit (attached to Leia); Verena Talos; Loku Kanoloa; Mak Eshka'rey; C-3PO; Rebel Saboteur x2; Targetting Computer x2 (attached to each Rebel Saboteur); and Rebel High Command. Command Cards: Hide in Plain Sight; Master Operative; Heart of Freedom; Slippery Target; Stealth Tactics; Recovery; Coordinated Attack; Hit and Run; Self Defense; Deadeye; Element of Surprise; Hard to Hit; Take Cover; and Urgency. Strategy: Despite it's strong theme (i.e. all spies) this is a well-balanced force. Verena and the Saboteurs hit hard up close, while Mak and Loku snipe from a distance. 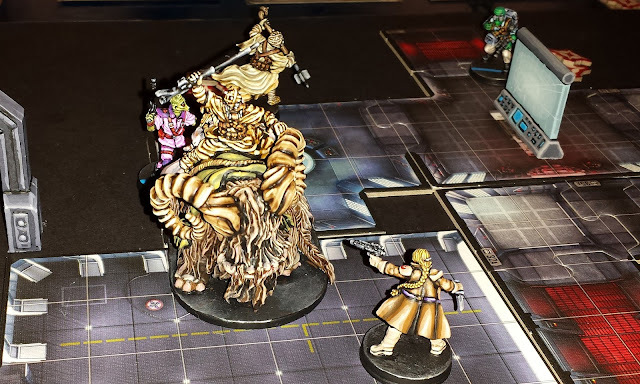 Everyone (except C-3PO) can benefit from command cards like Hide in Plain Sight and Slippery Target, making this strike-team exceptionally good on defence as well. The key is to keep mobile, and to get lots of use out of Leia's Battlefield Leadership ability. The game started off slow, with both parties tentatively sending out skirmishers through the halls of Kuat station, hoping to draw their opponents out. C-3PO ambled forward, oblivious to the Hired Guns fanning out around him. Meanwhile, the Rebels deployed their snipers into shadowy corners, hoping to wreak havoc next turn. The Mercenary's Nexu stalked into the med-bay along the South wall, hoping to catch an isolated Rebel. Only toward the end of the round did things begin to hot up. 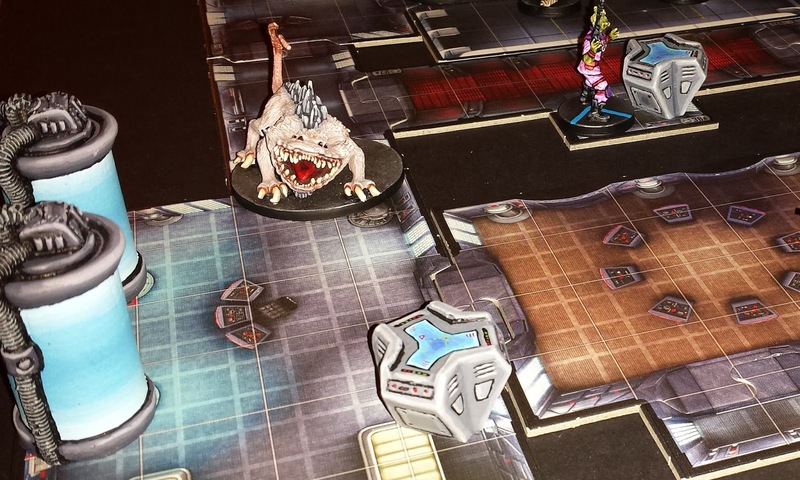 The Rebels opened their blast door. On each flank, their Saboteurs almost incinerated some Tuskan Raiders, but in both cases their attacks missed because of long range. ...But that was only the beginning of the Rebel's woes. The Banthas were getting restless. 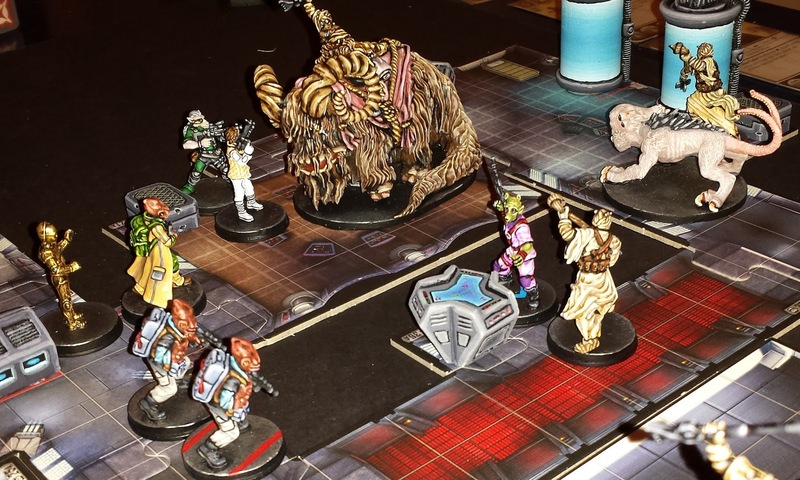 The first Bantha Rider (the green one) charged at Verena Talos and her team of Saboteurs in the Northwest corner. He stampeded and stomped one Saboteur into jelly, and left Verena mortally wounded. And then the second Bantha (the red one) surged out towards the centre of the station. Spurred by his Beast Tamer, he covered a tremendous distance, crashing into Leia and Mak and injuring both. Mak used Slippery Target to back away, but how to escape from such a big monster in such a small station? Just as the 1st turn seemed about to end, things got even worse. I was lucky enough to draw both copies of Jundland Terror for my initial hand of Command Cards. 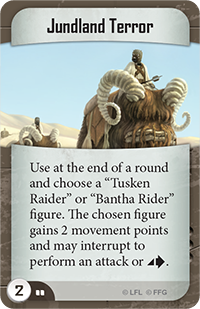 This deadly card allows a Bantha to take a move and then perform an extra action/attack at the end of the round. Why not use them both, one on each Bantha? Thus Verena Talos was hit again -- but worst of all, the red Bantha now had a clear path to plow into C-3PO, Mak and Loku. Using his Stampede ability, he sat on all three heroes of the Rebellion, ignominiously killing them with his great shaggy buttocks. The second turn was over quickly. The Rebels, who now had initiative, tried to save Leia. She activated early, frying the Nexu and trying to back away to safety. But the red Bantha Rider, impelled by the Beast Tamer, gave chase, crushing Leia to death against a wall of the space station. After that, the rider still had the wherewithal to shoot and kill a surviving Mon Calamari Saboteur. Meanwhile, his mate, the green Bantha ran down Verena. Such an ugly end for two beautiful heroes. At this point, we called it. 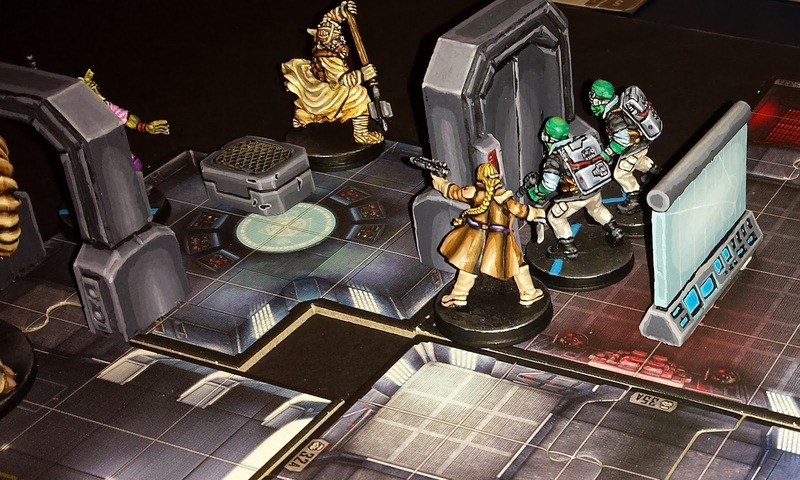 We've seen some one-sided games of Imperial Assault, but this was the worst. Besides losing the Nexu and one Tuskan Raider, the Mercenaries were almost unharmed and had access to 2 of the 3 relay stations. The Rebels, on the other hand, were Bantha Fodder. When I fielded two Bantha Riders, I had no idea they would be so deadly. They have great speed, a decent long-range attack and tonnes of staying power -- plus a devastating range of abilities in close combat. The narrow confines of the Kuat Station made this combination irresistible. And all for only 9 points! As you mentioned beast tamer is unique. Also you cannot play multiple instances of the same card in the same instance/moment. For example you cannot play jundland terror into another jundland terror. Nicos and I puzzled over the rule against playing the same Command Card in the same instance. The classic example when you can't play the same Command Card twice is during one attack role -- but it wasn't clear whether the rule applied sequentially at the end of a round, when applied to different figures (i.e. 2 different Banthas). Because we are pretty low-intensity players, we didn't spend too much time worrying about it -- but I suppose in tournament play, your interpretation would probably be correct, Matei. Great looking IA report Matthew! Minis are awesome! 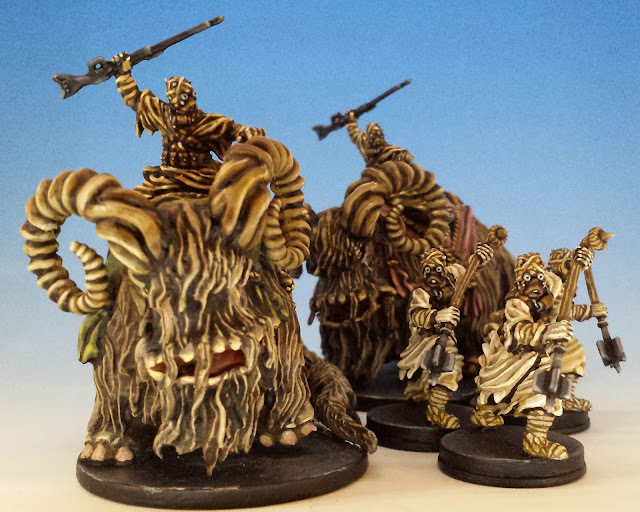 Awesome painted figures indeed! Wow! Looks like great fun, the models are beautifully painted. So glad to see rebel scum crushed under the might of... Sand people. The same race obi wan scared off by waving his arms in the air. How do you paint the faction logos on the shoulders of some of the figures? I bought both ultrathin markers and tried painting. Painting seemed better, but I didn't get as precise of lines as you seem to have. I also thought about using a "stamp" or something like that. What worked well for you? I paint them on. But, as you've noted, it's not easy. Generally, it requires a lot of "shaving" -- that is to say, if I'm painting a white logo on a black background (on a shield or a shoulder pad or something), I'll apply a crude white outline of my logo, and then shave it into a proper shape by applying thin lines of black along the edges of the white logo. When applying the thin lines of black, you use the edge of your brush, so that must of the brush is already on the areas of the shoulder or shield that are already black. I find that working in this way lets me get smooth lines. Really great looking and evidently fun game! What else can one ask for? Thanks everyone - I'm really glad you liked the pics and report! I'm set to play another game with Nicos tonight... RETURN OF THE BANTHA! This looks great! So, do you by chance sell the terrain?